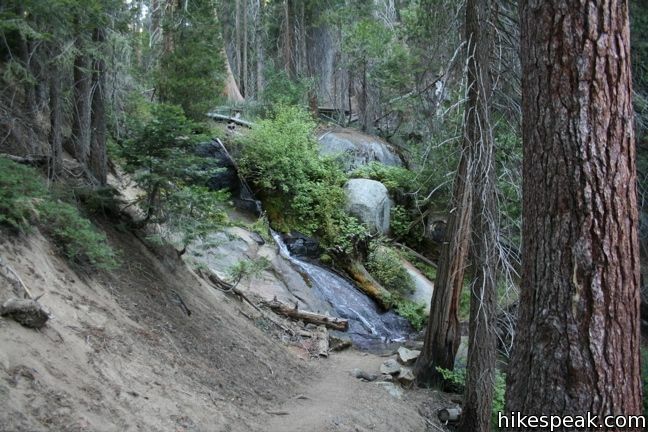 Campers at Atwell Mill in the Mineral King region of Sequoia National Park are in a perfect position to take a stroll down Hockett Trail. 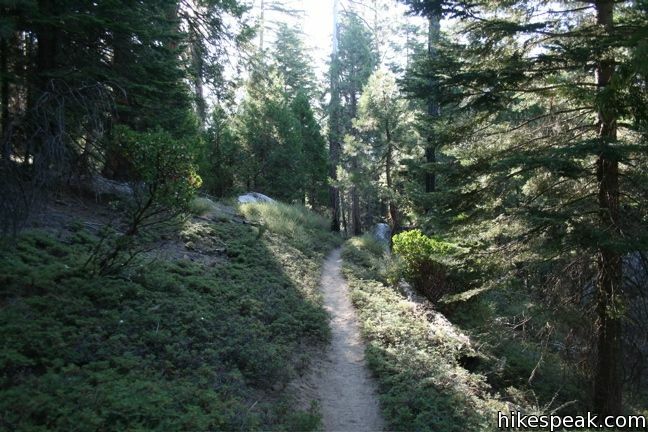 This forest path descends southeast for 1.5 miles to a footbridge that crosses the East Fork of the Kaweah River. 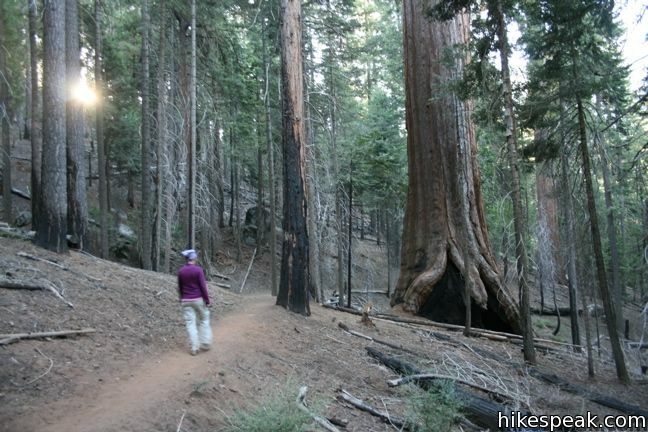 Along the way, the trail passes pines, firs, incense cedars, and the occasional Giant Sequoia. 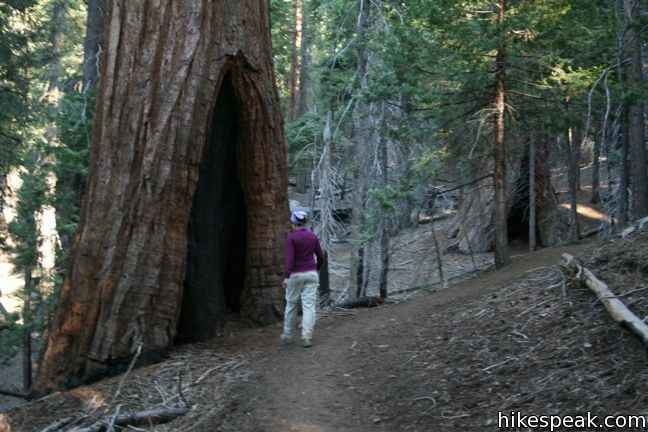 Hockett Trail continues far beyond the bridge, passing through the East Fork Sequoia Grove after another mile. 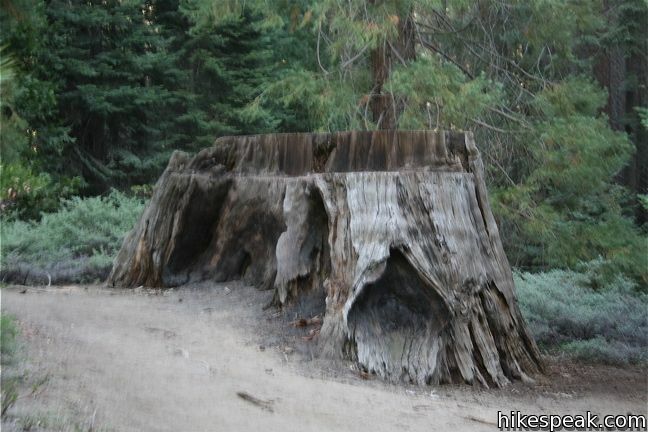 Here the giant sequoias remain well preserved, having the good fortune to avoid the nineteenth century lumberjacks who left behind all the stumps at Atwell Mill. Those not staying at the Atwell Mill can park in the lot on the east side of the campground. The trailhead is located near campsite 16, where bear boxes are provided. 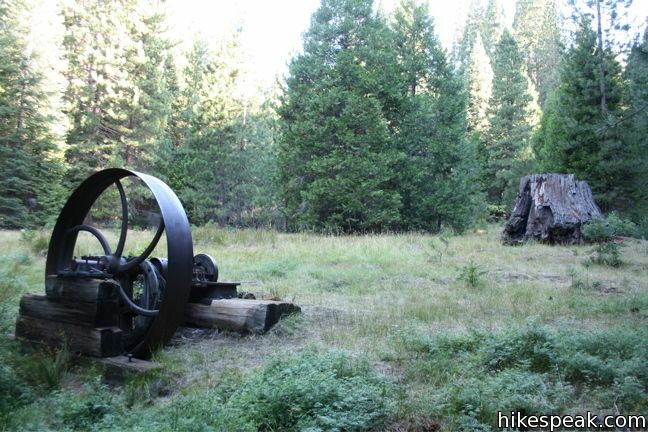 The hike to the East Grove is around 5 miles round trip. 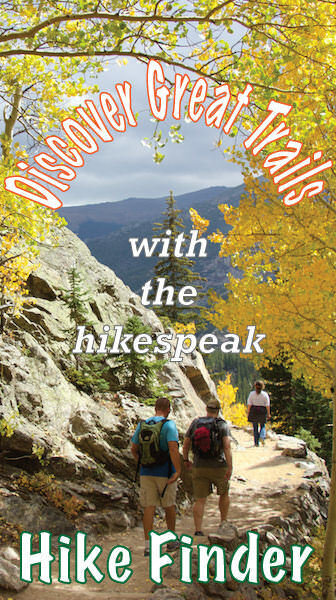 Backpackers can venture even farther up the trail to more remote corners of Mineral King. A wilderness permit is required for all overnight treks, and subject to trail quotas, but no permit is needed for day hikes in Mineral King. 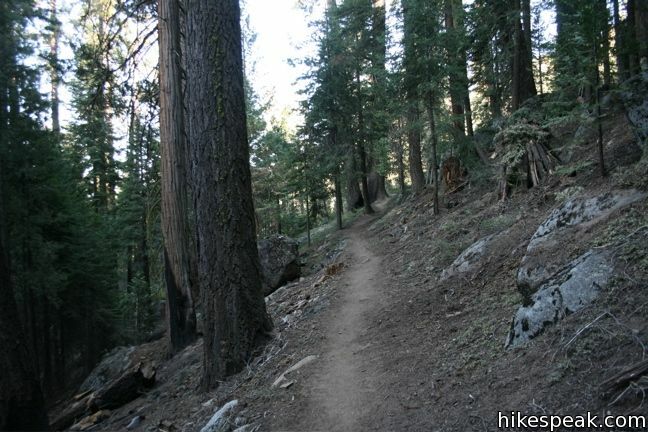 Hiking down Hockett Trail to the bridge over East Fork Kaweah River is 3 miles round trip with 600 feet of elevation change. Humans aren’t the only creatures who enjoy Hockett Trail. Apparently, this is a also good place to see bear cubs in the early morning, which is why the photos stop halfway down the trail. Rather than get in between a mother and her young cub, I backtracked to Atwell Mill. The bridge and grove will have to wait for another trip to beautiful Mineral King. 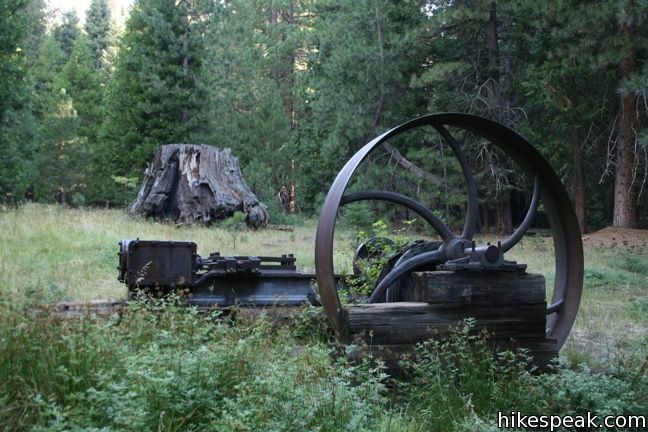 To get to the trailhead: From the city of Three Rivers, head southwest on Mineral King Road to Atwell Mill Campground. Mineral King Road is steep, narrow, and twisty, with blind curves that demand patient driving. The 19-mile climb to Atwell Mill can easily take an hour, so factor this into your drive time. 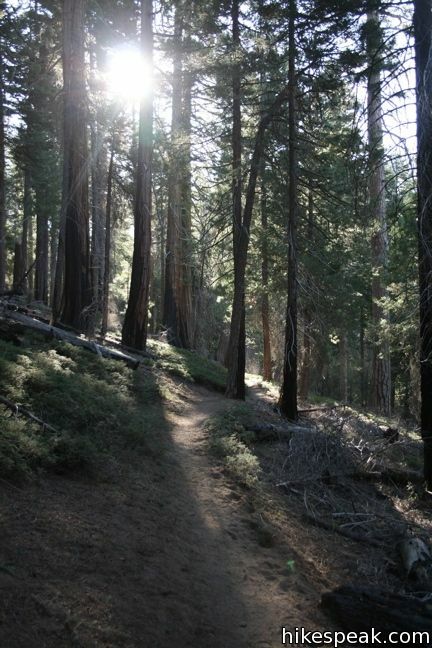 The trail starts from the campground. This 9.4-mile hike visits a spectacular pair of lakes high above Mineral King Valley. Fourteen campgrounds with over 1,000 total sites are spread throughout the park to facilitate your visit (including Atwell Mill Campground and Cold Springs Campground in Mineral King). Last summer I went to Atwell Mill Campground. I hiked on the trail that took me to a bridge and a waterfall. It was beautiful. After the hike I was sitting in my camping chair at the campground having a beer when I heard twigs snapping. I looked to my right and about 40 feet away I saw a big brown bear walking. It went up a mountain. I was a little nervous. But it was exciting! Just an FYI for anyone else that reads the above comment: “Brown bears” — if one is referring to the species, which includes grizzlies — are not found in Sequoia or Kings Canyon, or anywhere in California. There are, however, plenty of “Black bears” that are brown in color. Just thought folks would want to know — encountering black bears is really common in Sequoia/Kings Canyon, but they are also routinely chased away by banging pots and pans (as long as they DO NOT YET HAVE YOUR FOOD). Brown bears (i.e., grizzly) are an ENTIRELY different story. Yep. JD got it absolutely right. 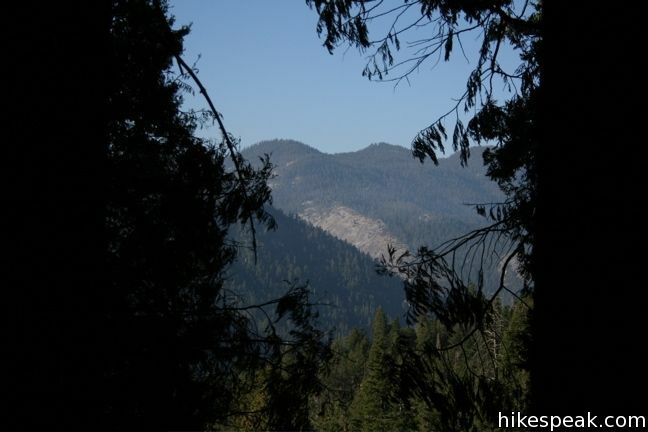 Is the Hochett trail also called the East Fork Grove Trail? Ive been looking up East Fork Grove Trail and they both seem similar.